Difference between revisions of "Dapping Block"
24 Dapping Punches with sizes from 2.3mm to 24mm. 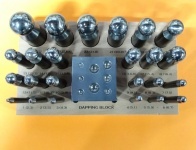 Dapping block has 18 hemispheres to form jewelry or small precision parts. This page was last modified on 12 January 2019, at 17:53.